Magadheera movie became a landmark film in the history of Telugu cinema by collecting unheard amounts at box office. Magadheera is a technicians’ delight and we are in the process of getting their special interviews. In an exclusive series of interviews to idlebrain.com, art director Ravinder R explains us about various sets he has done for Magadheera movie. 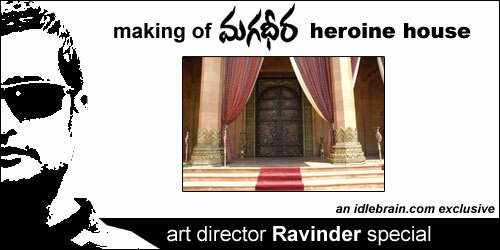 Heroine’s house set was the last set constructed for Magadheera film. This house is constructed in an outdoor location in RFC where the arena set was also constructed and destroyed. I had the task of balancing the set with ornaments of 400-years of royal heritage and modern architecture. If you carefully looked at the various photos shown, you will realise that most of the furniture and interiors resemble the royal heritage.